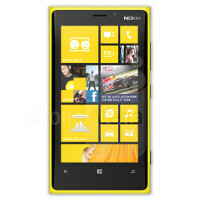 Nokia Lumia 920 is a smartphone developed by Nokia that runs the Windows Phone 8 operating system. It was announced on September 5, 2012, and was first released on November 2, 2012. It has a 1.5 GHz dual-core Qualcomm Krait CPU and a 114 mm (4.5″) IPS TFT LCD display, as well as a high-sensitivity capacitive touchscreen that is covered by curved Gorilla Glass. It supports inductive charging (it can be charged by being placed directly onto a charging pad) and is compatible with Qi Inductive Charging; further, it features an 8.7-megapixel PureView camera with optical image stabilization for still images and videos. It comes with 32 GB internal storage, but has no card slot; hence it cannot be expanded with memory cards. Its touchscreen also can be used with the gloves worn by the user. As some reviewers criticized the thickness and weight of the phone, Nokia presented the Nokia Lumia 925, a lighter and thinner version of the Lumia 920 with an aluminum body and an improved camera. Remember that entered PIN on the website must be exactly the same as PIN entered in the setup program on your Nokia Lumia 920.